WASHINGTON - Despite poor weather conditions in many states, today's Super Tuesday primaries have once again proven that absolutely nobody knows what in the hell the average American voter is thinking. With Trump currently projected to win in at least 7 states and many GOP insiders seriously contemplating suicide, Hilary Clinton is likewise expected to beat Bernie Sanders in a showing that nobody without easy access to legalized marijuana seriously questioned. As if to quell the GOP establishment, Trump was typically diplomatic. "I don't give a damn what any of those idiots think of me," Trump screamed at supporters. "When you've got 'em by the balls, their hearts and minds will follow!" Clinton, meanwhile, spent much of the evening secretly drinking heavily as she contemplated the prospect of facing the billionaire casino owner and reality T.V. star in an actual general election. Bernie Sanders, in true form, celebrated something. "Not only is this one of the most interesting election cycles in recent history, it has to be, and I'll check this, one of the stupidest exhibitions of American political frustration and apathy in a generation," noted Harvard professor of politics Jude Landlawson. "This is a tsunami of indifference mashing violently against an increasingly disenfranchised and powerless voting bloc; one that is finally able to express every latent bias and horrible prejudice that would otherwise get them chastised by a modern society that has left them behind. In short, [Trump] has become a pressure valve for the bigoted, a sort of relief valve for the undereducated and unsophisticated. And they're exercising the one thing they've got left: their vote." When a reporter corrected DiCaprio, noting “Kung Fu Panda” was an animated film, the actor abruptly ended the interview. 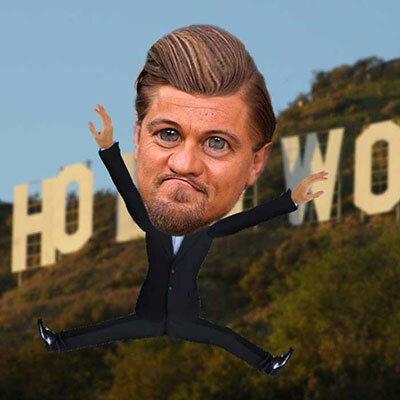 DiCaprio, who became the public face of the “anti-prairie oyster” movement in 2014, has long shown an interest in the well-being of animal performers working in the Hollywood system. Starting with his friendship with the animal wrangler on 2002’s “Gangs of New York,” DiCaprio began speaking publically shortly afterward about the “horrible, long hours” spent by animals involved in a major film production.